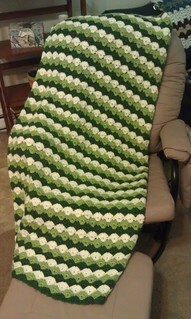 The stitch used for this lap afghan is a shell plus V stitch variant. I felt the original workup of 9 double crochet in the shell didn't set well across the line, so I made changes to suit my own workmanship. It measures 31" x 57", for my finished version. It's similar to the Twilight Shells Throw from Red Heart, but I didn't like how their pattern was for the shells. So I made my own version. Here is the pattern for mine! 3 Skeins each of Dark Sage, Pistachio, and Off White. I'm not experienced with gauge, I mainly just use a 5mm crochet hook and medium yarn. Repeat rows 3 through 6 to desired length. Other colors work well too, so long as you have a contrasting color added in! Shelly thank you for this pattern!!! I was like you and after doing 4 rows of the Red Heart Pattern I tore it all out and searched for a much neater and cleaner shell .... Yours is working out great for me !! To make this wider, what would the increments be for the starting chain? I'm not certain on the multiples for this as it is my very first pattern that I have ever put together and it was based on another pattern, which does not tell you multiples either. My guess right now is add 8 ch for each 'set' till you get what seems to be wide enough for you. Then test it with the second row. If you do, please let me know how it turns out! It very pretty! I'm going to add it to my growing to do list! I love this! After a trip to Ireland and seeing the "40 shades of green" I've been collecting greens and rainbow yarn to make an afghan for my daughter (named Colleen and born on St. Patrick's Day). I have been looking for over a year for a pattern that I thought would look like the hills and dales of Ireland and this is it!! Hooray, my search is over, thanks so much. This is so beautiful! I only looked for a few minutes and found it. Oh, lucky me. I'm going to do this in something in the red shade for my Mother-in-law who loves the color. Thanks! 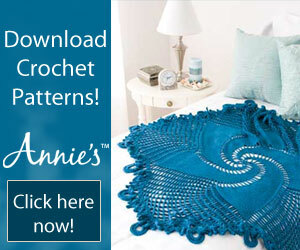 OH, do u know how many skeins and the yardage you used to make this? I didn't see it mentioned. I used Caron Simply Soft, which is 7 oz skeins. I believe I used 3 of each color. I'd buy four to be safe! Happy Hooking! I am making this one right now & will donate it to a local retirement/nursing home. I will have pics on my blog when finished. My blog is named Knead2sew.blogspot.com. I am also a quilter, love to knit, crochet, bake, cook, share cleaning tips, etc. It's a problem because I simply can't do everything I love! Thanks much for sharing this - the folks at the home will LOVE it!! Thanks Mary! And Thanks for being such a caring person! Happy Hooking! Sounds wonderful! Would love to see a photo! Julia, did you find the issue you were having? Hope so! Happy Hooking! I am confused.. on row 6 it says "shell in next ch1 sp" is this supposed to be the original shell from row 2??? Sorry if that is a dumb question lol. Thank you! !! Hi Kayla! Yes, that is why it says in row #2 (shell made). That's the shell you'll be using throughout. Oh I am sorry I must have missed that. Thank you for your reply to my dum dum question. lol onward I go! Because of how I weaved my ends in, and hadn't begun to learn about making borders, I didn't add any to this one. However, current projects that I'm working on will have borders. Check out my facebook to see more! hook and in each ch across; turn – 151 sc. repeat from * across, changing to B in last sc; turn. end at **; (2 tr, ch 1, tr) all in last sc; turn. ch-5 changing to C; turn. repeat from * across working last sc in top of ch-5; turn. next sc; repeat from * across changing to A in last sc; turn. Nancy, yes that is the pattern that mine is based from. However, when I originally published my version, I had said that I didn't like how they created their Fan & V Stitch blanket so I created one of my own. 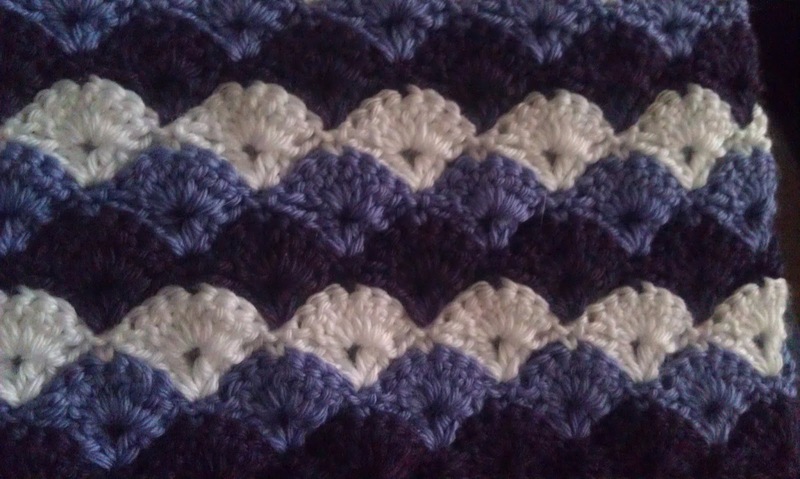 I use the same Stitch (which can be found here: http://newstitchaday.com/how-to-crochet-the-fan-v-stitch/) but I put mine together a bit differently. I found my own version to be easier to crochet. Thank You so much! I searched & searched for the just right pattern! I'm making it for my mother in laws' 100th birthday next month! She's in a wheel chair & is so cold natured . And, it Had to be Purple!....even though she has dementia ... She remembers Purple is her favorite color! I'm making it in cream, aubergine & lilac. Looking pretty! Thank you, I wasn't able to figure that out. Thank you very much for posting this! I also started out using the other pattern and did not like it. Your pattern is much cleaner and it looks awesome! Totally going to add this one to my list of things to make, though I'll probably try mine in autumn colors! I would take it out and redo the row just in case. It's been a long time since I worked on this blanket. I like doing shell stitch baby blankets and I found this one a nice difference and a little lighter. I also live using Caron for baby items. So soft and shiny. Thank you! I saw you used Caron simply soft. 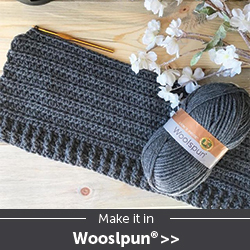 Is that a worsted weight 4? Any idea how it would change with a lighter fingerling yarn? I LOVE this pattern. However, I made 1 small change. I don't like the 'tightness' of doing the starting chain then a single crochet row. I used a chainless single crochet foundation row. I also only used 2 colors. Turned out GREAT! Well done.